This endangered species had been reduced to fewer than 200 pairs when Laura started birding in 1975, but with protection from the Endangered Species Act, habitat in Michigan has been restored and maintained, and cowbird control has permitted breeding birds to raise their own young successfully. 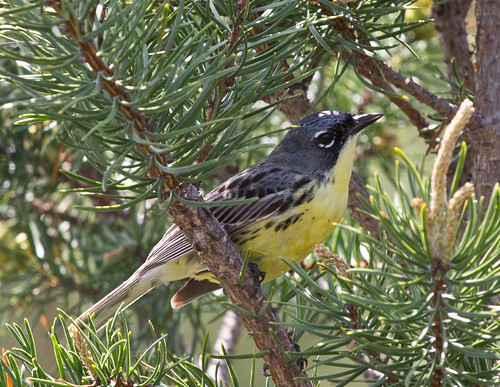 Now a few Kirtland’s Warblers are nesting in Ontario and Wisconsin. Laura has seen them during fall migration at Lake Kissimmee State Park in Florida, during spring migration at Magee Marsh in Ohio, and in a small nesting territory in Bayfield County, Wisconsin. Michigan Audubon, the Michigan Department of Natural Resources, and the U.S. Fish and Wildlife Service provide tours of the breeding habitat that give you a great chance to see and hear breeding birds for a nominal fee. Details are available here.